Help Sally make her way from the humble beginnings of a stylist in her hometown shopping mall to the super star status of a top beautician in glamorous Hollywood. As you grow and evolve your very own virtual beauty salon, you’ll meet a diverse group of emotional customers. 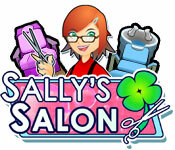 From little old ladies to punk rockers, you’ll work with Sally to make the world a more beautiful place one customer at a time in Sally’s Salon, an exciting Time Management game.